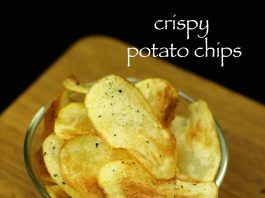 potato chips recipe | homemade potato chips | potato wafers recipe with detailed photo and video recipe. basically a thin slice of potato which is deep fired till crisp and then spiced with pepper and salt for taste. it is typically served as party snacks for kids, appetizer and even sometime as side dish. 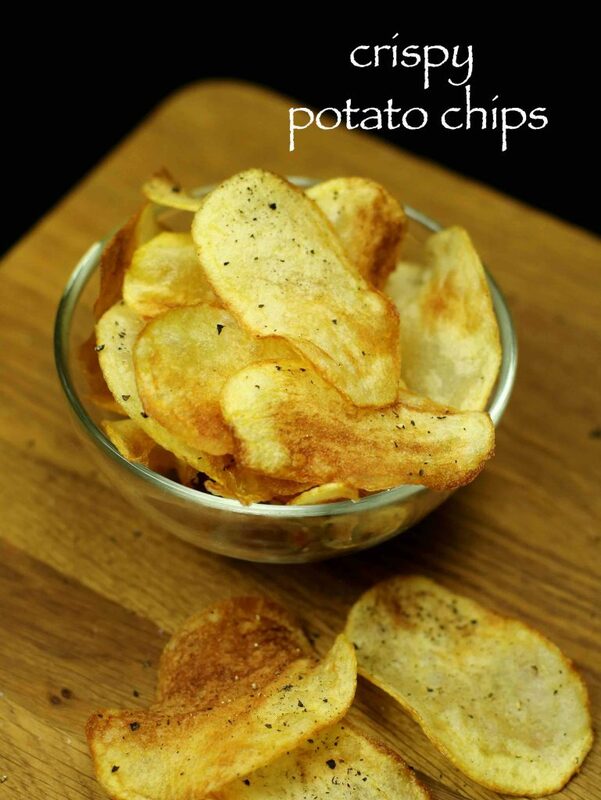 potato chips recipe | homemade potato chips | potato wafers recipe with step by step photo and video recipe. 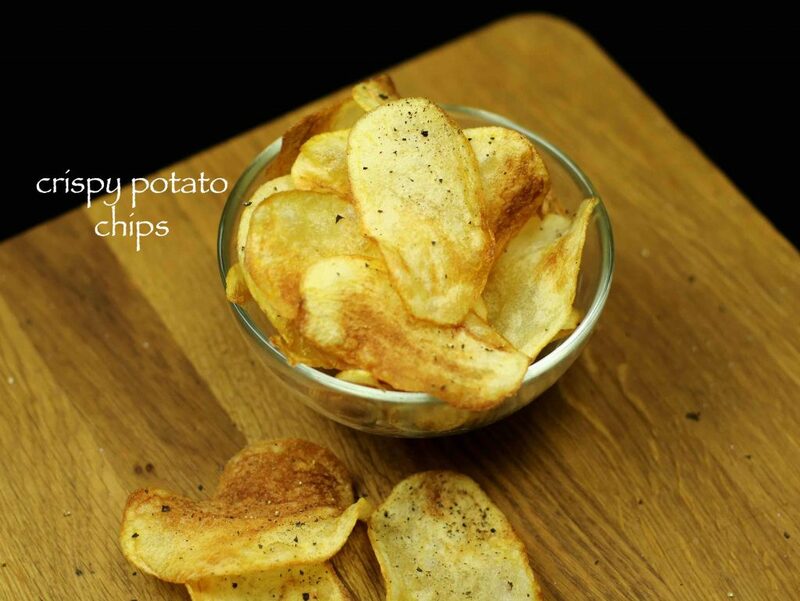 this is a basic potato chips recipe which is flavoured with pepper and some salt. 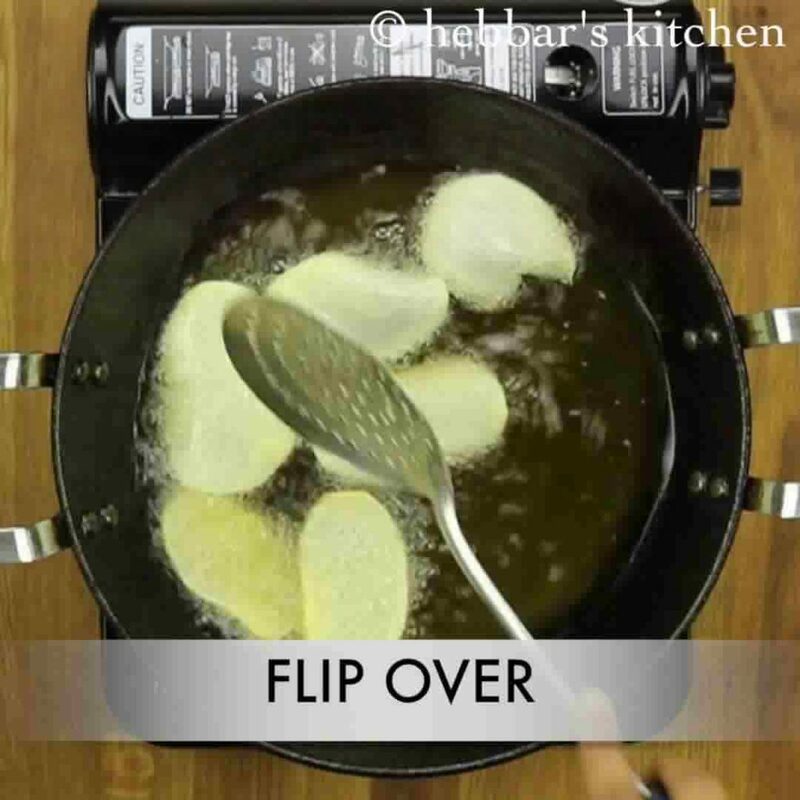 before frying, the thin slices of potato, it is soaked in water to remove excess starch. later it is deep fried in oil till it turn out golden crisp in colour. i prepare the potato chips recipe quite frequently, but never thought of coming up a video recipe for it. until my husband suggested me to come up with a video. i really liked the idea of preparing homemade potato chips. in this recipe i have used pink or red potatoes which turn more crisp after frying compared to traditional ones. however, you can still use the white potatoes or normal potatoes, but you may have to soak it for longer time like 1-2 hours. furthermore, some important tips for a crisp and crunchy potato chips recipe. firstly, do not forget to soak the thin slices of potatoes in water. soaking removes excess starch from potato slices. 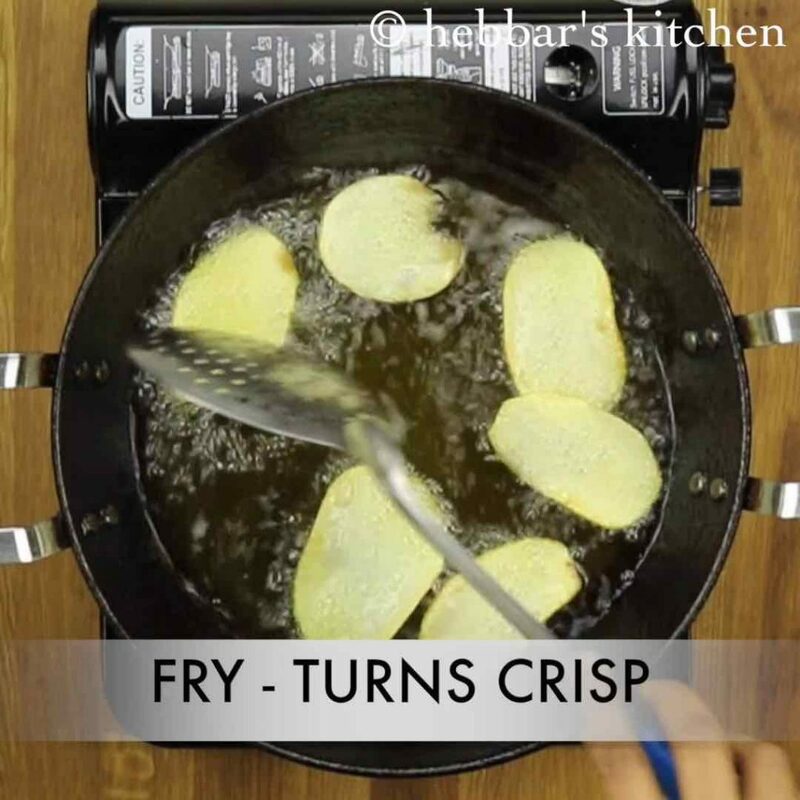 if fried with starch, chips would turn dark brown with less crisp. secondly, if you wish to have salt and vinegar flavour chips, than soak the potato slices in vinegar for 30 mins after soaking in water. lastly, if you do not wish to deep fry the chips, than you can bake it in oven, preheat the oven for 10 mins at 230 degrees C. than bake it for 30 to 45 mins depending upon the quality of potatoes. firstly, peel the skin of potato and slice. 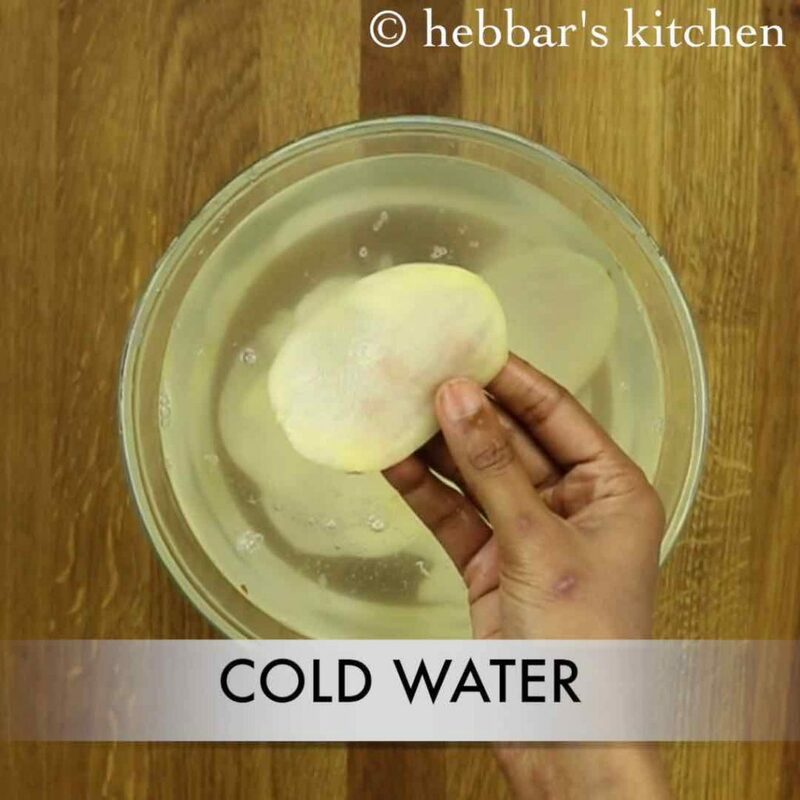 transfer the sliced potatoes into ice cold water and rest for 30 minutes. 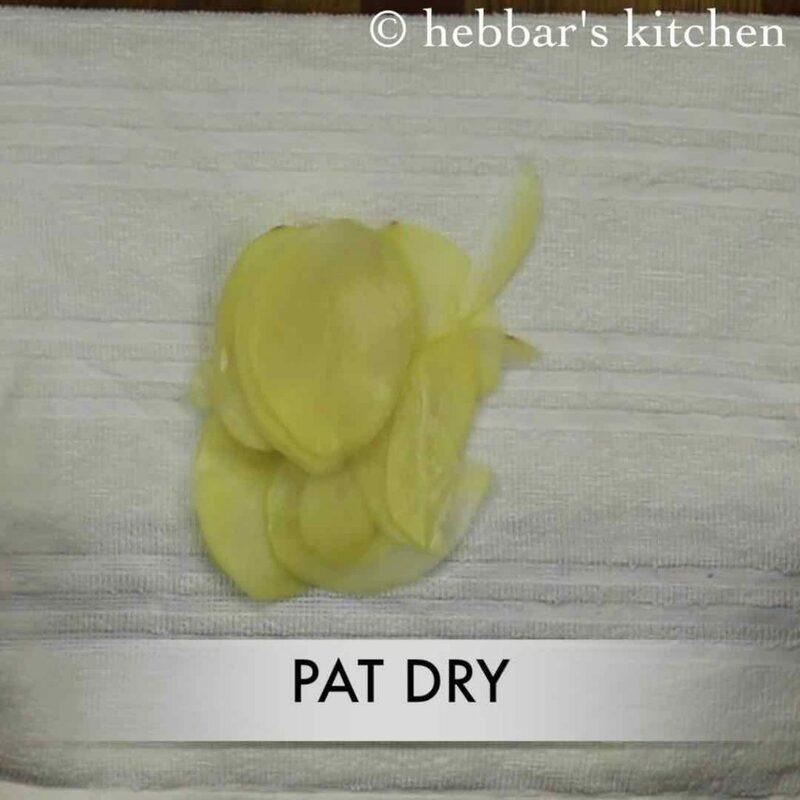 further, drain and pat dry over a kitchen towel. this prevents oil from spluttering. take the sliced potato one by one and deep fry. 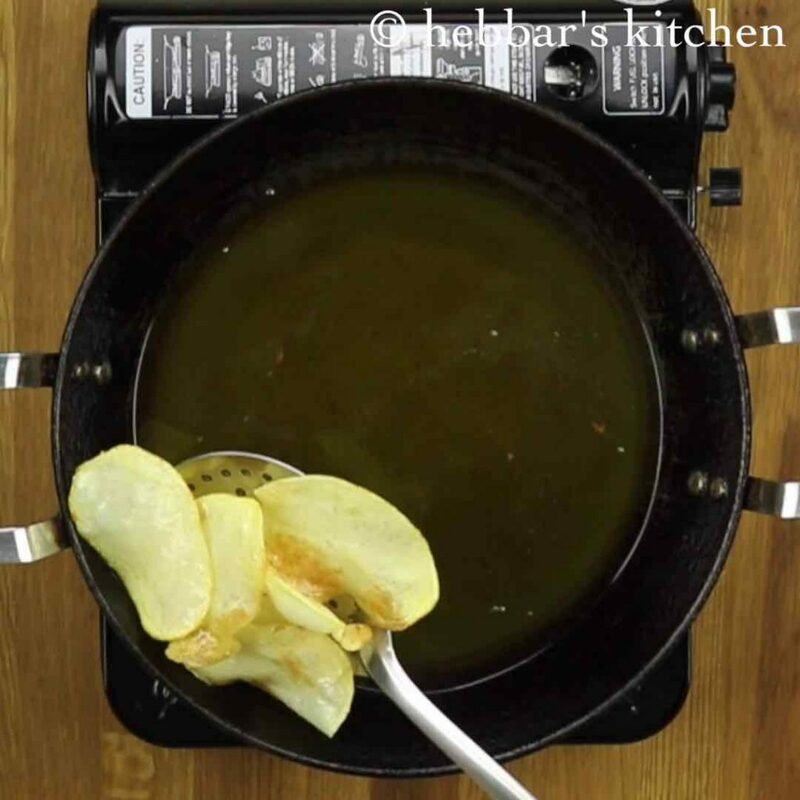 deep fry the sliced potatoes in hot oil. 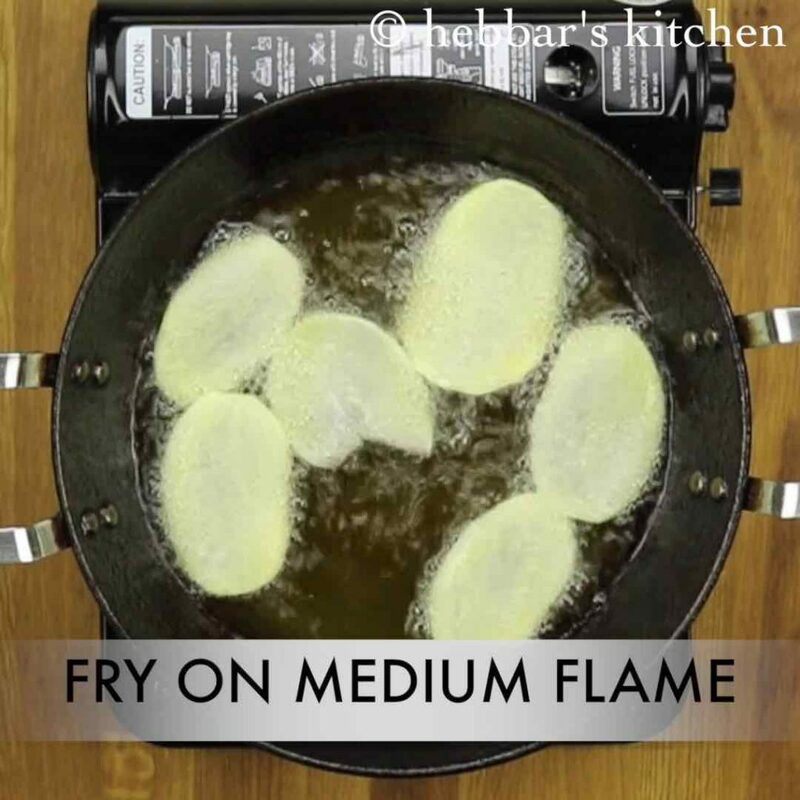 further, reduce the flame to medium and fry. stir occasionally and fry on both the sides. once the potato slices turns crips and slight golden spots start to appear over the edges. further, drain off the potatoes over kitchen towel to remove excess oil. also immediately sprinkle some salt and pepper over chips and mix gently. finally, potato chips are ready to serve or store in airtight container. firstly, peel the skin of potato. use royal red potato for more crispy and tasty potato chips. even brown potatoes works great. however, washed potato doesn’t work. further, slice the potatoes thinly with the help of slicer. thinner the slice the more crisp the potato chips will be. transfer the sliced potatoes into ice cold water and rest for 30 minutes. 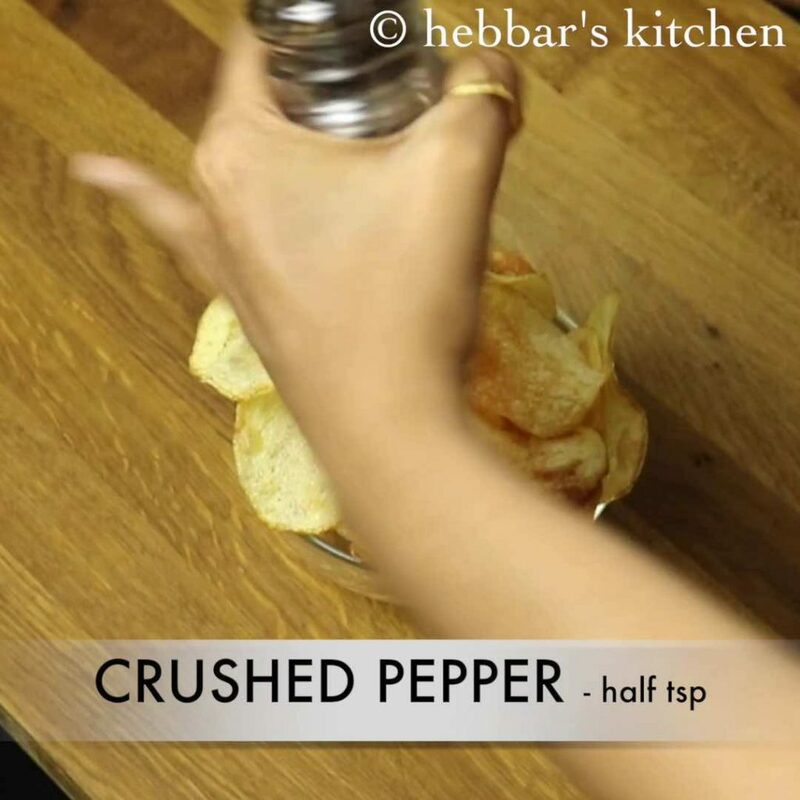 do not skip this step as they help to make chips more crispy. then wash with running water if there is too much starch. take the sliced potato one by one and deep fry in hot oil. 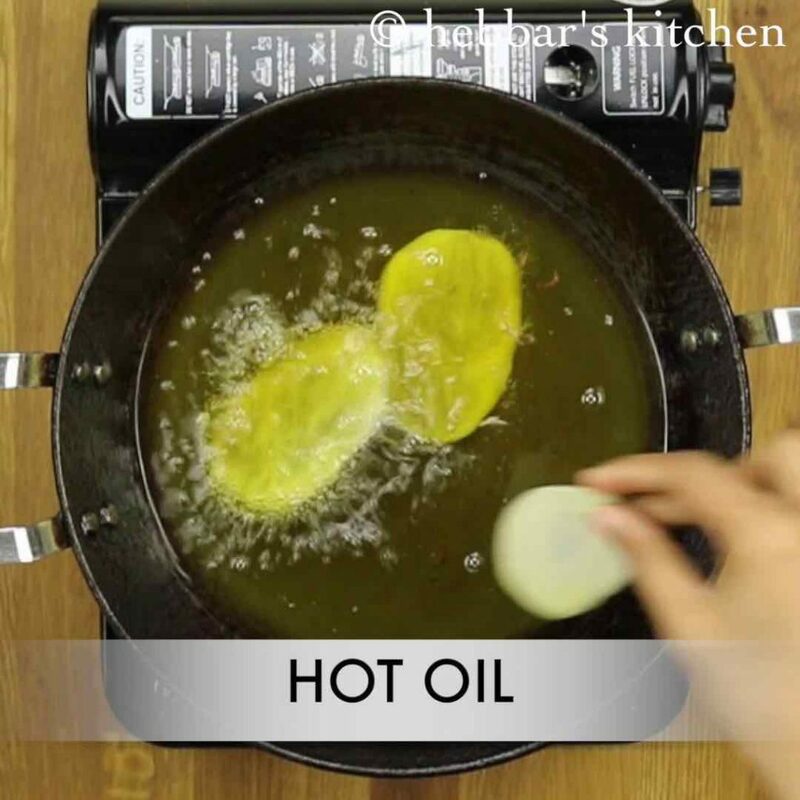 do not over crowd the oil, and also try to fry same size pieces together in a batch. firstly, use fresh red potatoes for crispy and tasty potato chips. furthermore, fry on hot oil and then reduce to medium. also soak in cold water minimum of half an hour for more crispy chips. moreover, to bake in oven, preheat and bake at 230 degrees C for 30 to 45 mins depending upon the quality of potatoes. finally, potato chips taste great when sprinkled some salt, peeper or chili powder. What you used is red potatoes right? Instead of red potatoes Can I use normal potato? red potatoes?? u meant sweet potato? need to fry stirring occasionally! !..else will not get cooked uniformly..